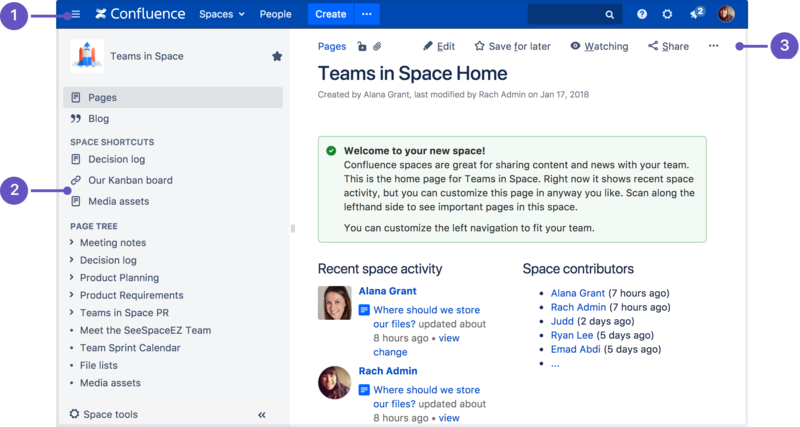 You can create a page from anywhere in Confluence; just choose Create in the header and you're ready to go. Pages are the place to capture all your important (and unimportant) information; start with a blank page and use it like a word processor to add rich text, tasks, images, macros and links, or use one of the useful blueprints to capture meeting notes, decisions, and more. Select space: choose the space where you'll create the content. Page templates: create a page from a template or create other types of content. Parent page: your page will be a child of this page. Once you decide on a blank page or blueprint, you'll be taken straight into the Confluence editor. The editor is where you'll name or rename your page, add the content, and format it to look great. When you've added some content, choose Preview to take a peek at what your finished page will look like, and Publish when you're ready to make it appear in the space. After you save you'll see the page in 'view' mode. You can re-enter the editor any time by choosing Edit or pressing E on your keyboard. Confluence header: create blank pages, pages from templates and visit spaces or your profile. Space sidebar: access pages, blogs and administer the space. Page tools: edit or share the page, watch it to get updates and perform more actions. Another useful way to create a page is to use the Create from Template Macro. This macro allows you to choose a page template, and adds a button to the page allowing one-click page creation. If you want others to create pages using this template, this is a great option. Need input from your team members? Multiple people can edit your page at the same time. Hit the Invite button in the editor and either grab the link, or enter some people or groups to invite by email (they need the appropriate Confluence and space permissions of course). See Collaborative editing for all the ins and outs. Once you've created a page, you can decide if you want to keep it private, using restrictions, or collaborate on it with others using @mentions, sharing, and comments. You can also organize pages in a hierarchy, with child and/or parent pages for closely related content. When you navigate to a Confluence page and choose the Create button in the header, the page you're creating will by default be a child of the page you're viewing. Have as many child pages and levels in the hierarchy as you need to, and move pages if you want to change their location.